The Professional Fighters League is hitting the nation’s capital this summer, with a card headlined by welterweight veteran Jake Shields and Ray Cooper III. Formerly known as the World Series of Fighting, the PFL’s third major card will take place on July 5 at the Charles E. Smith Center in Washington, D.C.
PFL 3 will mark the continuation of the league’s 2018 season, which kicks off on June 7. The plan is for there to be 11 events showcasing fighters from six different weight classes, all competing in a regular season and playoffs leading to a show on Dec. 31 where the best fighters in each division will vie for a $1,000,000 prize. 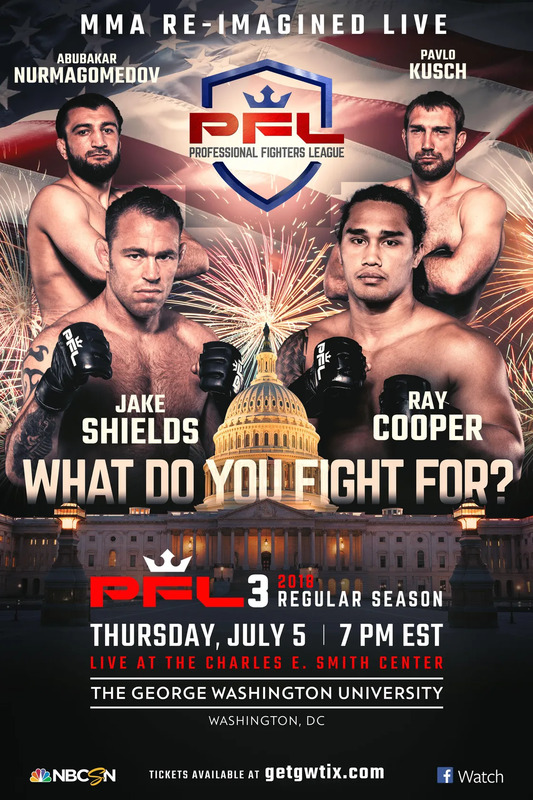 The July 5 show sees Shields (32-9-1, 1 NC), a former Strikeforce middleweight champion and one-time UFC welterweight title contender, take on Cooper III (13-4), who is actually the son of a fighter that Shields split a pair of fights with over a decade ago. Other notable welterweights competing on the show include Abubakar Nurmagomedov, the cousin of UFC lightweight champion Khabib Nurmagomedov, and UFC vets Rick Story, Yuri Villefort, and Paul Bradley. Middleweights John Howard, Eddie Gordon, Gasan Umalatov, Bruno Santos, Danillo Villefort, and Bojan Velickovic will also step into the PFL cage with UFC experience.